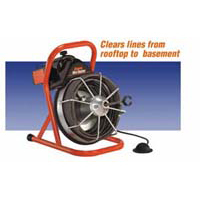 The Mini-Rooter clears lines from roof top to basement, including kitchen, bath and laundry. With 50 ft. of 1/2″ cable, it weighs just 60 lbs. This inexpensive, easy-to-use machine has lots of time saving features. For instance, you can remove the zinc-plated cage in seconds for more portability or to switch to a different cable diameter with no mess or lost time. Safety features include an air foot switch, ground fault circuit interrupter, and a safety slip clutch. An integral inner drum and distributor tube help prevent cable tangling under load.